We can even assist you in fulfilling and negotiating all aspects of the artist’s production rider, secure bids for staging, sound & lighting, with a keen & experienced eye towards quality and value. We can also consult on hospitality riders, handle transportation, lodging & catering while keeping related expenses within your budget, and provide an on site production representative to handle all requirements of your event. Let us know how we can help make your next production the best it could possible be. From concept to final implementation, let Titan productions help promote your next event. Titan’s basic approach to talent buying is to provide the right entertainment at the most reasonable cost, bearing in mind the demographics of your intended audience, the venue and setting, the budget, ticket cost (when applicable) and the time of year. Titan Productions, through it’s Creative Entertainment division, has long established relationships within the entertainment industry, and is capable and prepared to negotiate and book the biggest names in entertainment. Titan can offer artist routing dates on touring acts with the best possible pricing for it’s clients. 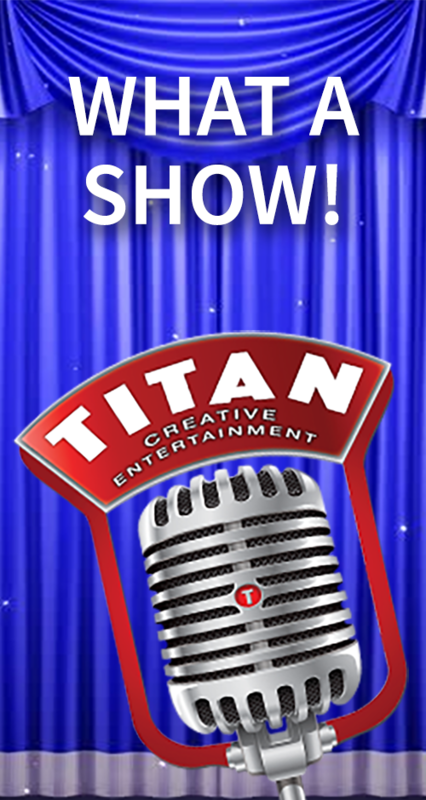 Titan has booked thousands of acts in the most genres such as Headline acts, Tribute style shows, Vegas/Broadway production shows, Corporate acts, Party/dance bands, Comedians, Dancers, Celebrity speakers/stars, Buskers & DJ’s. Titan is recognized in the industry from Festival & Events Ontario, for Talent Agency of the Year. Of course, if all you need us for is simply to ask a few questions or have us advise you on your event, we’re here for you. We can advise on acts, budgeting, scheduling, production requirements, etc. We’re here to help. Titan Productions, through our Creative Entertainment division, can offer many different services to assist you with your event. From planning, promotions to production, logistics and even talent buying, let Titan help make your next event a successful one.